Check out this epic new Dragon King print by kaNO, entitled “White Dragon”. It features Bruce Lee in his classic ceremonial Gi, which he sported in the iconic film Enter The Dragon. This white colorway of the print was created to match the Dragon King White Edition 20” vinyl figure that was sold exclusively by Milk Magazine in Hong Kong. White Dragon by kaNO is an 18”x24” signed and numbered giclée print on Moab Entrada 290gsm Cotton Rag paper. 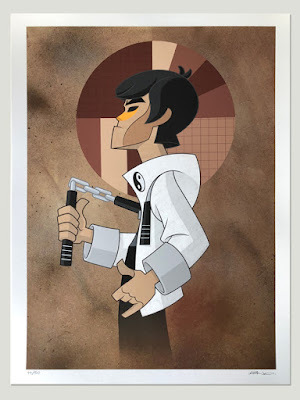 Limited to just 50 pieces, fans can purchase this epic Bruce Lee print now at kaNO’s online store for $50. Mighty Jaxx is finally expanding Jason Freeny’s epic line of super sized Sesame Street XXRAY vinyl figures with a dissected Big Bird! Originally a humble children’s show, Sesame Street has grown to be a celebrated American pop culture icon. 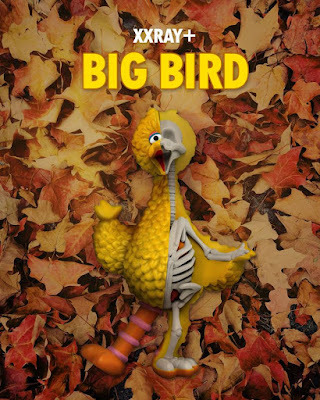 For its final release of 2018, Mighty Jaxx is proud to present the brand new Big Bird XXRAY Plus! 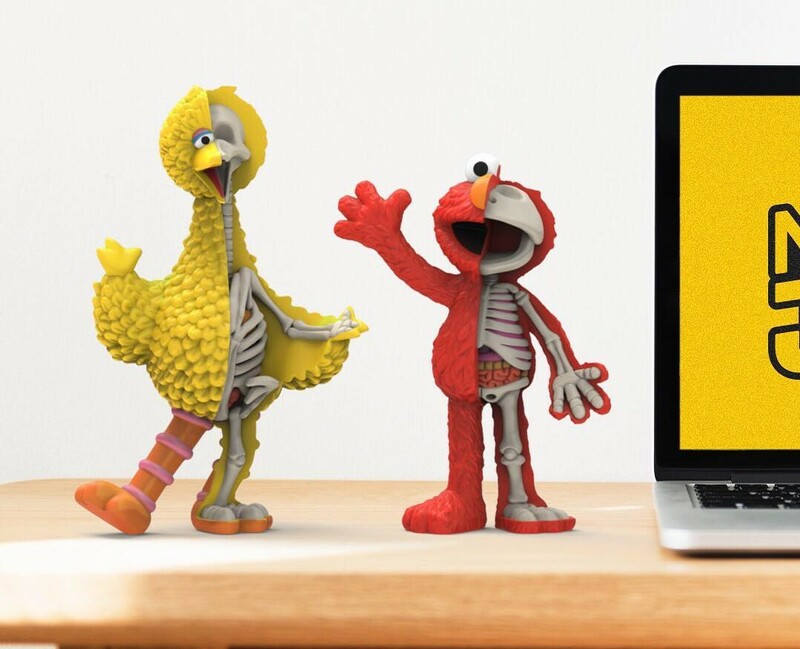 For this release, everyone’s favorite big yellow bird Big Bird has been meticulously dissected by artist Jason Freeny in his signature x-ray style as an amazing 10” vinyl figure. This officially licensed, limited edition PVC art collectible can be pre-ordered now at the Mighty Jaxx online store for $139. 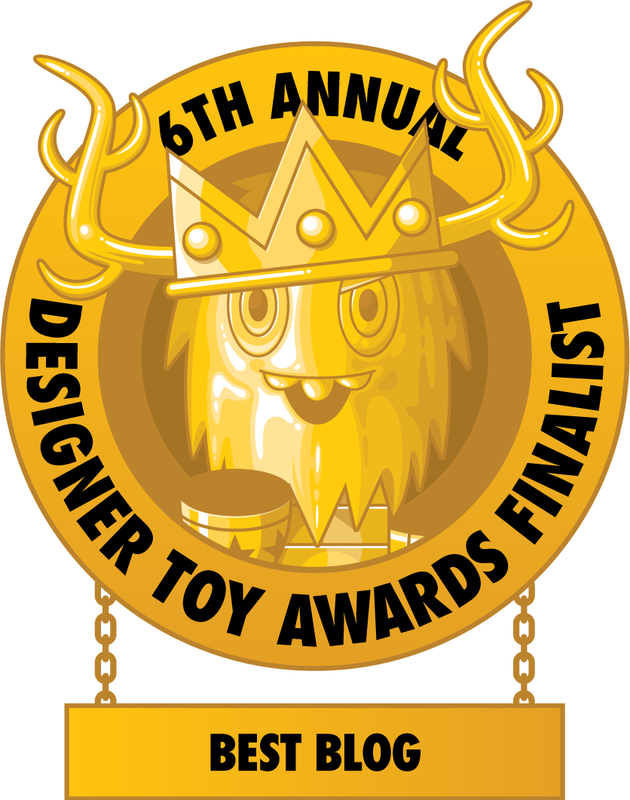 It’s going to look fantastic with their previously released Elmo XXRAY+ figure! The hype surrounding Aquaman, DC Comics’ latest live action film, just seems to be growing as the film’s box office total keeps rising. 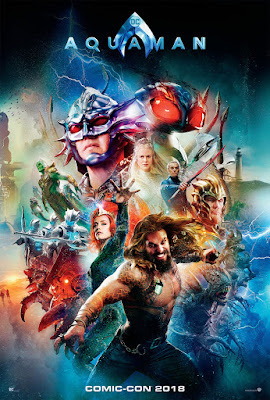 The #1 movie in America features Jason Momoa as the King of the Seven Seas and founding member of the Justice League. It’s really quite amazing that DC has done so well with films like Wonder Woman and Aquaman, but still can’t get Superman right. Here’s hoping Shazam is good to keep the momentum going! 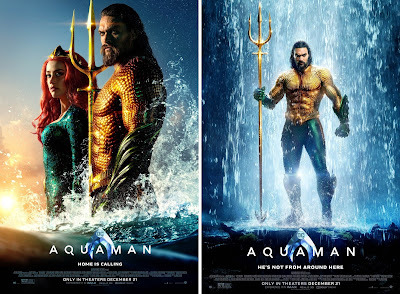 While The Blot still hasn’t seen Aquaman, I love seeing Momoa in Arthur Curry’s classic orange and green costume in these final theatrical one sheet movie posters and banners. On Sunday, January 6th, from 12:30-2:00pm the Japanese American National Museum will be hosting a very special Gerald Okamura x Max Toy Company event! It is a conversation with Kaiju vs Heroes artist Mark Nagata about his newest limited edition vinyl figure, the Master of Weapons, a homage to the character portrayed by martial artist and actor Gerald Okamura in the movie Big Trouble in Little Tokyo, and how this project can to fruition. 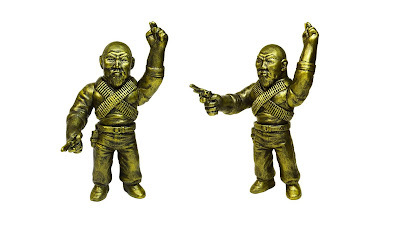 To commemorate the event, Nagata and JANM will be releasing this beautiful Gold Edition Master of Weapons Gerald Okamura soft vinyl figure. This wonderful Master of Weapons sofubi figure comes hand painted by Mark Nagata and is limited to just 45 pieces. What’s really cool about this event is that Gerald Okamura will be there as well! Both Nagata and Okamura will be available after the discussion to sign the figure and a special print of the header art for the toys. Any remaining pieces will be made available at the JANM online store after the event. 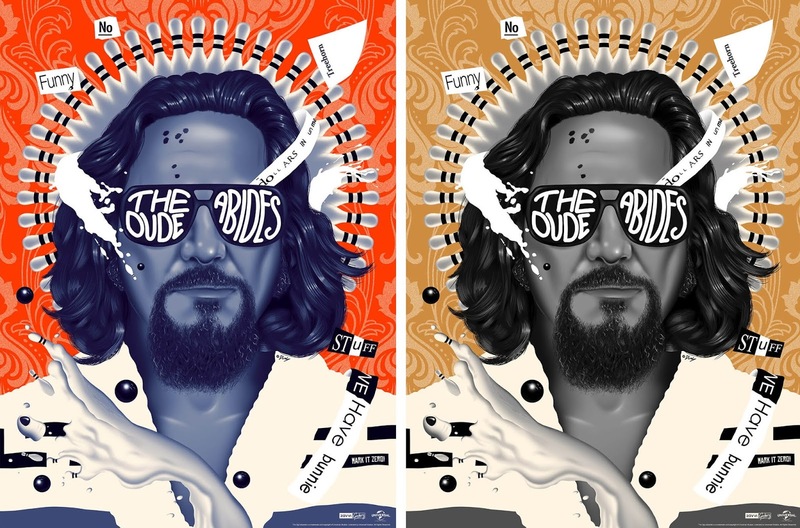 This weekend, Zavvi will celebrate the 20th anniversary of The Big Lebowski by releasing this fantastic “The Dude Abides” screen print by artist Doaly! It’s hard for The Blot to believe that one of my all-time favorite films is actually 20 years old. I can still remember seeing this iconic cult classic in the theater. 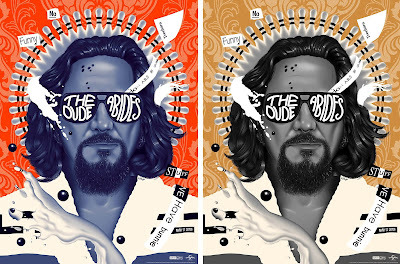 The Dude Abides by Doaly is an 18”x24” hand numbered The Big Lebowski screen print on 270gsm Mohawk superfine paper. The Regular Edition is limited to 200 pieces and retails for £39.99, while the Variant is limited to 125 pieces and retails for £49.99. Both versions will go on sale at 12pm London time on Saturday, December 29th, at the Zavvi online store. After Aquaman’s opening weekend, DC Comics’ latest live action film is now the #1 movie in America! 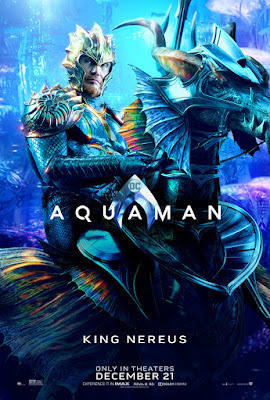 Fans everywhere are drooling over Jason Momoa’s take on the King of the Seven Seas, and yet… The Blot still hasn’t seen the film yet. Argh!!! 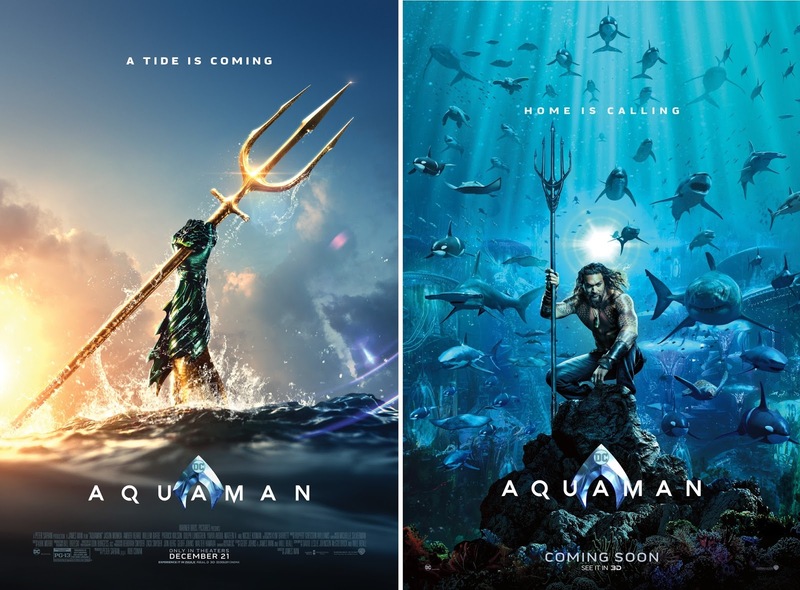 Until then, I’ll just stare at these teaser one sheet movie posters and banners. 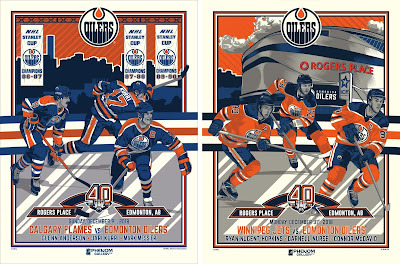 Phenom Gallery continues to its popular line of officially licensed NHL screen prints with the second and third posters in M. Fitz’ epic four print set celebrating the 40th Anniversary of the Edmonton Oilers! To celebrate this huge milestone, artist M. Fitz has worked with the club on four posters that will be released throughout the season celebrating both the past and present of the Edmonton Oilers. The second print features Oilers greats Glenn Anderon, Jari Kurri and Mark Messier, while the third print features Oilers stars Ryan Nugent-Hopkins, Darnell Nurse and Connor McDavid. Each Edmonton Oilers 40th Anniversary Screen Print by M. Fitz and Phenom Gallery measures 18”x24”, comes signed and numbered by the artist, and is limited to just 300 pieces. 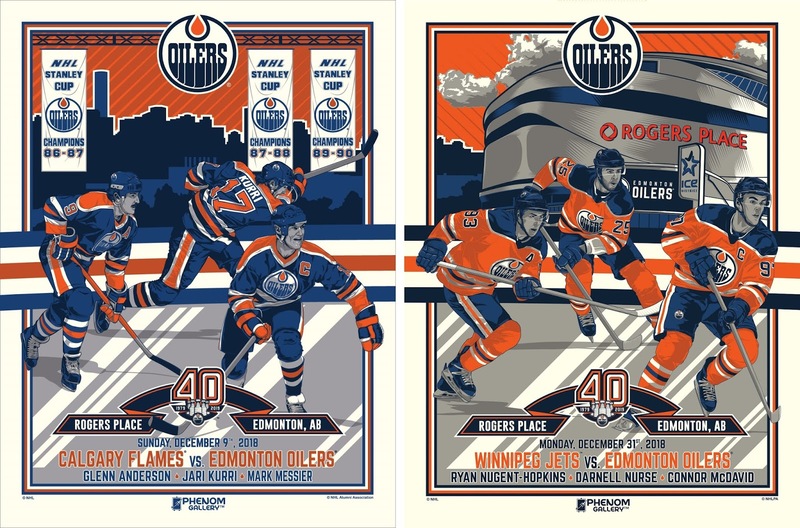 Fans can purchase these 6 color prints exclusively at The Oilers Store at Rogers Place for $60 each. The Thing by Matthew Peak is a 24”x 36” hand numbered glow in the dark screen print. The Regular Edition is limited to 225 pieces and will retail for $65/£50, while the Variant is limited to 125 pieces and will retail for $75/£60. Both prints will go on sale today, Thursday, December 27th. In the U.S. it can be purchased at 12pm EST at the Bottleneck Gallery online store, and at 5pm U.K. time at the Vice Press online store. 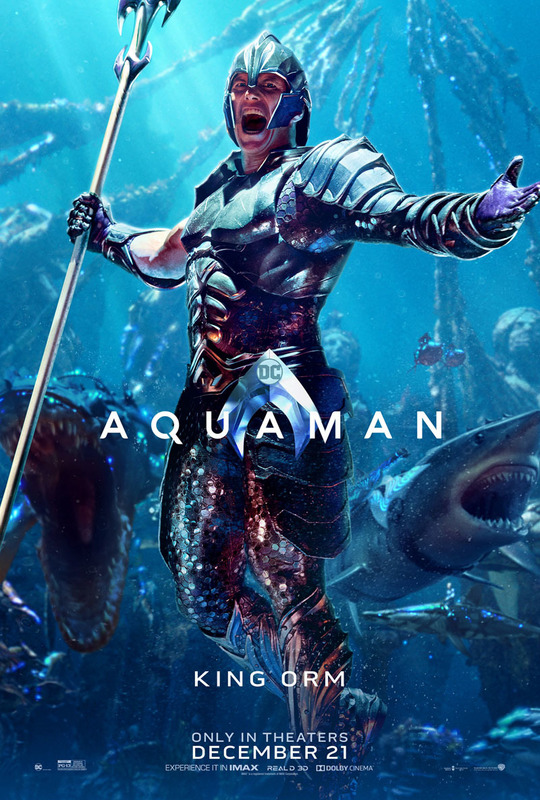 Aquaman, DC Comics’ latest live action film, is now in theaters everywhere, and to commemorate the film’s release check out this Aquaman One Sheet Movie Poster that was released exclusively at San Diego Comic-Con 2018. This illustrated SDCC 2018 Exclusive Aquaman Movie Poster is pretty rad, right? 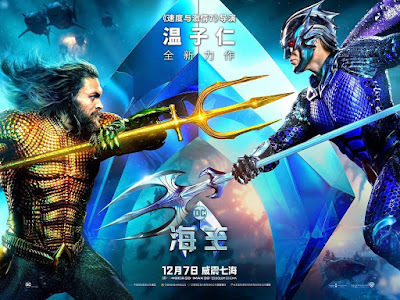 Opening weekend of Aquaman, DC Comics’ latest live action film, is here, and fans everywhere seem to be loving it! 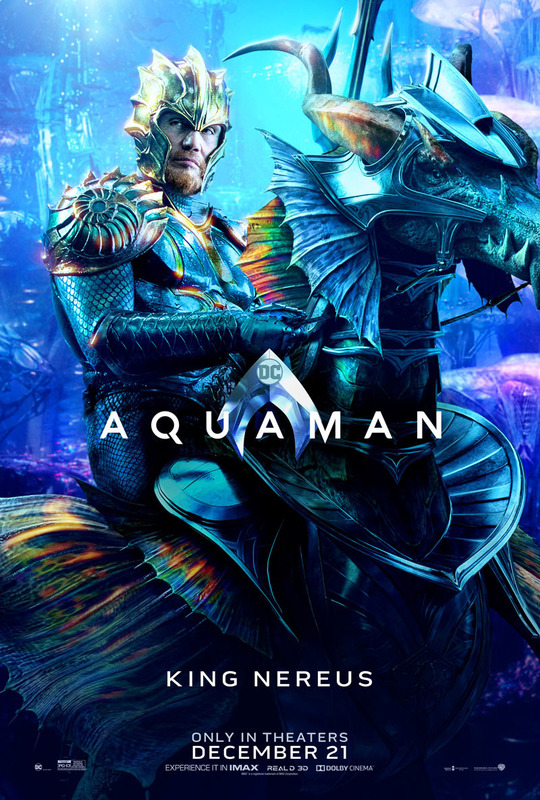 Jason Momoa’s take on the King of the Seven Seas is a hit. To celebrate the film’s release, check out these awesome international one sheet movie posters and banners. 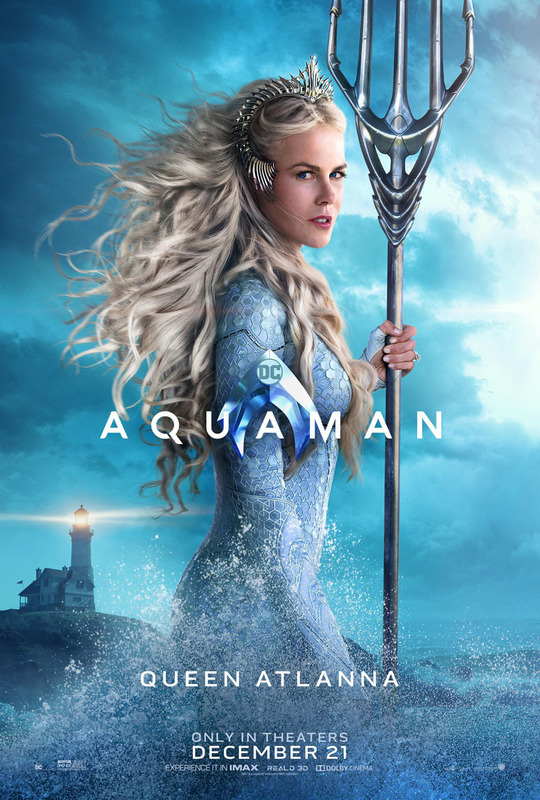 Who’s going to see Aquaman this holiday weekend? Our friends at Grits have dropped a very special holiday release, the “Haulin Grits” t-shirt! 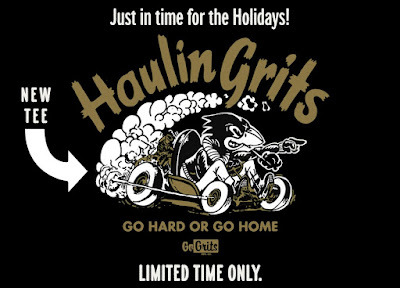 In life you either “Go Hard or Go Home.” This awesome tee is based off of the original Haulin Grits drawing, and features a front pocket print and back print. 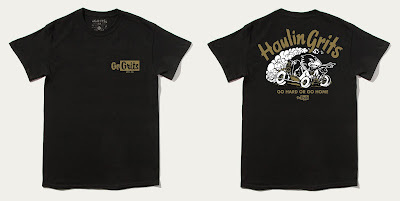 The vintage design was printed with water-based ink so it is soft to the touch. 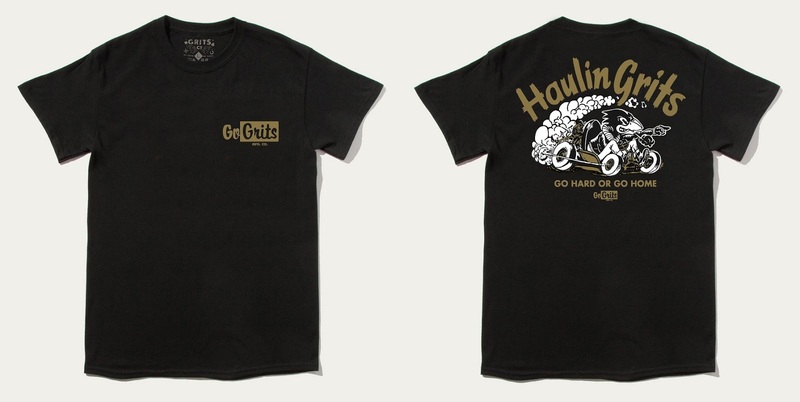 Fans can purchase the “Haulin Grits” t-shirt now at the Grits online store, in sizes S-3XL, for $35. New WWE Superstars Retro T-Shirts by HOMAGE – Daniel Bryan, John Cena, Stone Cold & More! Just in time for the holiday season, HOMAGE has released a killer new wave of officially licensed WWE retro t-shirts featuring five iconic WWE Superstars. This new crop of WWE Superstars Retro T-Shirts includes current world champion Daniel Bryan, John Cena, and WWE Hall of Fame members Stone Cold Steve Austin, Macho Man Randy Savage and Goldberg! All five WWE Superstars Retro Wrestler T-Shirts seen here are currently available at the HOMAGE online store, in sizes XS-3XL, for $32 each. 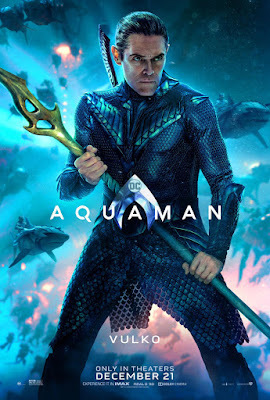 The Blot cannot believe it’s finally opening weekend for Aquaman, DC Comics’ latest live action film! 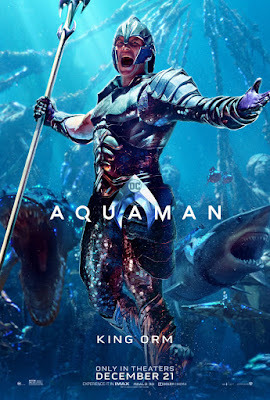 Fans seem to be going crazy for the King of the Seven Seas. 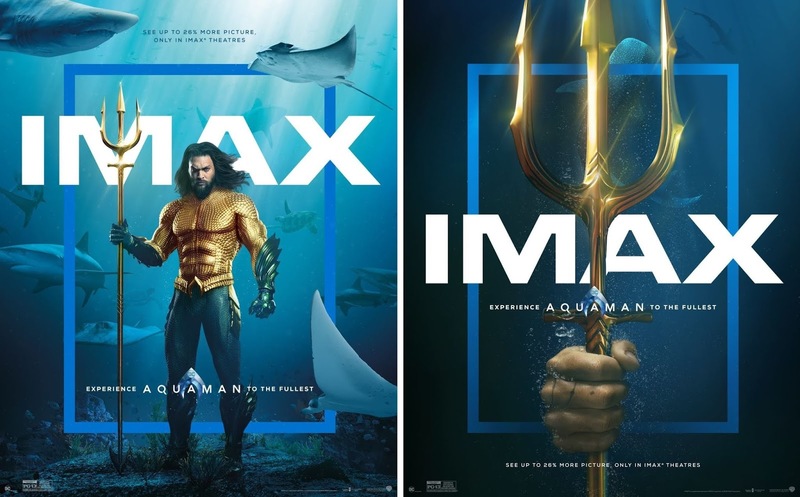 To celebrate the film’s release, check out these two awesome one sheet IMAX movie posters. Who’s going to see Aquaman this holiday weekend? 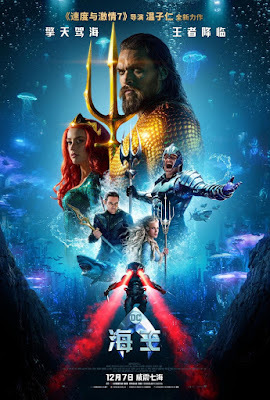 The Blot cannot believe the opening weekend for Aquaman, DC Comics’ latest live action film, is finally here! To celebrate the film’s release check out this fantastic set of character one sheet movie posters. Which one is your favorite? 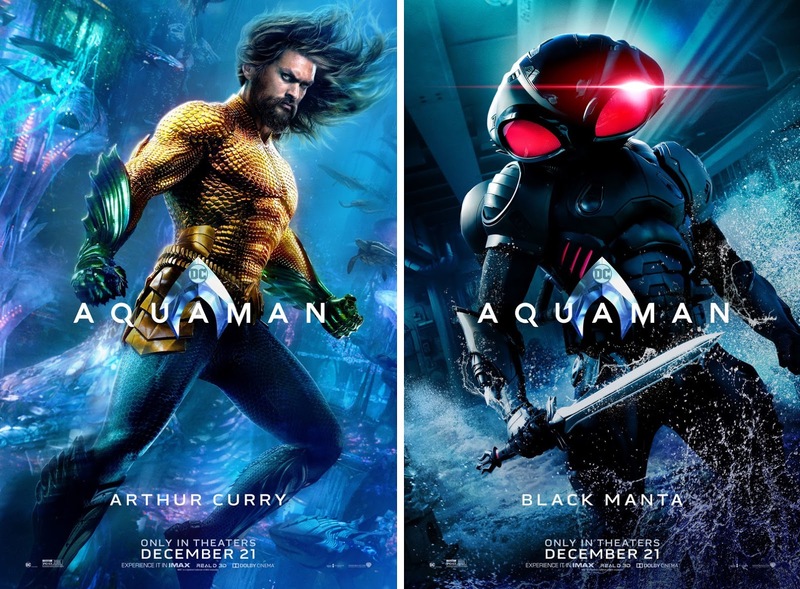 I’m kinda partial to Black Manta. 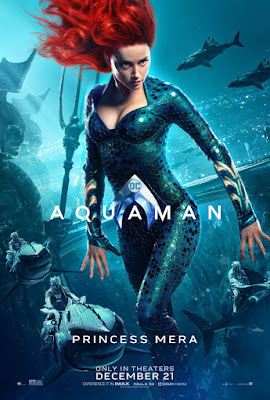 Have you seen the film yet? And if so, did you like it? No spoilers please! 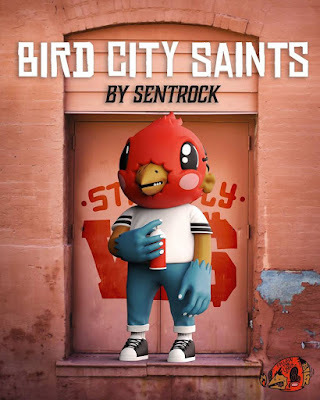 This is a huge week for fans of Sentrock and his Bird City Saint character, as the Chicago based artist had not one but two different vinyl figures released this week of his signature creation. Along with his previously announced sofubi figure, Sentrock has also teamed up with Mighty Jaxx to release this killer full size Bird City Saint vinyl figure! It's first colorway is the W$ Stay Fly Edition and looks fantastic. Sentrock’s Bird City Saint wears a mask as a symbol of freedom and liberation. A reflection of the youth growing up in the hoods of America, Bird City Saint strives to add positivity to a society shackled by their circumstances. Inspiring them to strive for more and to reach higher, Bird City Saint reminds everyone – It is not where they are from, but what they do that defines them. 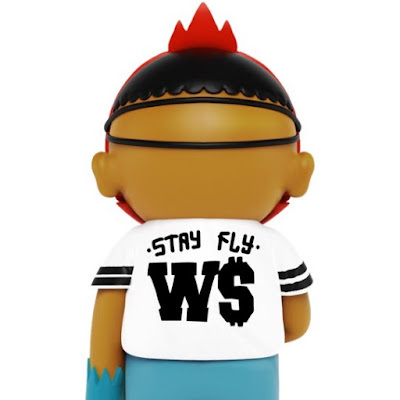 The Bird City Saint W$ Stay Fly Edition Vinyl Figure by Sentrock x Mighty Jaxx is an 8” vinyl art collectible. Limited to just 100 pieces, collectors can pre-order this fully painted figure now at the Mighty Jaxx online store for $129. 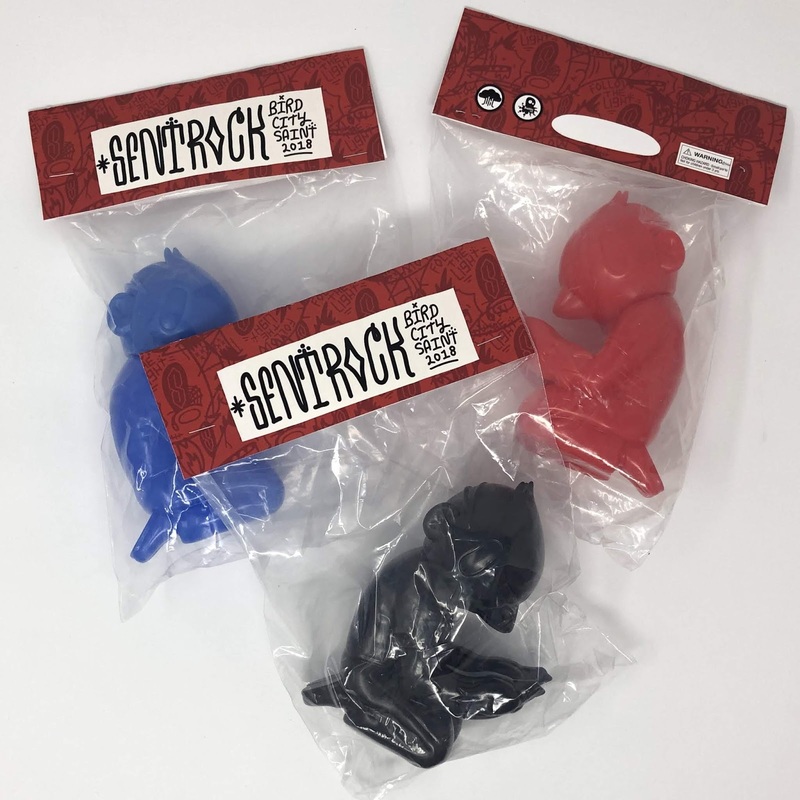 Sentrock’s killer new sofubi figure of his classic character, the Bird City Saint, is back in three fantastic unpainted colorways! 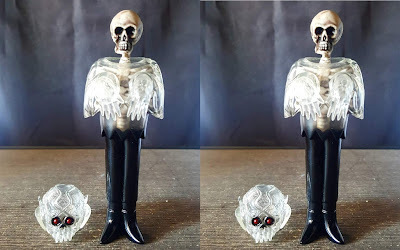 Designed in collaboration with DoomCo Designs and produced by Squibbles Ink, the Bird City Saint sofubi by Sentrock stands 5.5” tall and comes kneeling looking at his bird like hands. This unpainted release of The Bird City Saint comes cast in red, blue or black soft Japanese vinyl. Collectors can purchase all three editions now exclusive at the Galerie F online store for just $45 each. Each figure comes bagged with a header card. 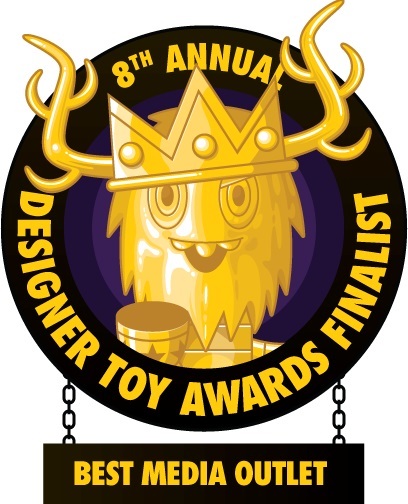 Sleigh it this Christmas with the Santa Guan vinyl figure by Tik Ka From East! 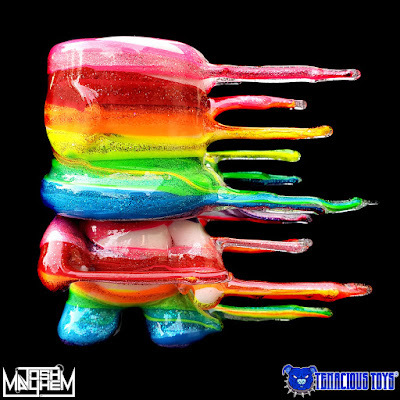 Mighty Jaxx has once again teamed up with Tik Ka From East to release one of his fantastic designs. This epic East-meets-West mash-up of legendary Chinese warrior Guan Yu and beloved festival icon Santa Claus is the Christmas must-have that we didn't know we needed. 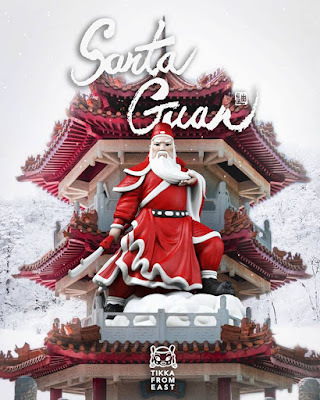 Inspired by the loyal and brave Guan Yu, as well as the generous and kind-hearted Santa Claus, Santa Guan combines these two good spirited beings into one epic new character. While retaining his signature big beard and Green Dragon Crescent Blade, Guan Yu is given a festive make-over in red and white. His Santa-esque black boots allow him to ride clouds freely, bringing the gift of relentless fighting spirit to children (and collectors) everywhere! 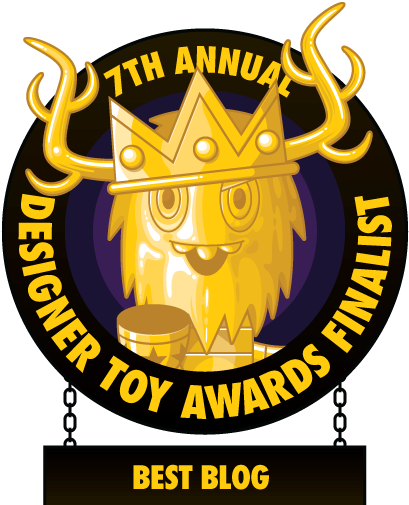 The Santa Guan Vinyl Figure by Tik Ka From East stands 8” tall, comes packaged in a full color printed box, and is limited to 300 pieces. Collectors can pre-order this jolly figure now at the Mighty Jaxx online store for $159. 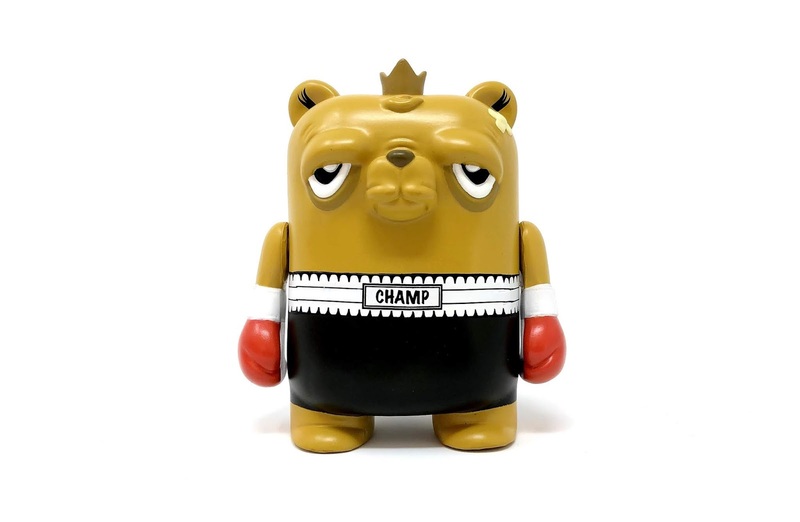 The third colorway of popular Chicago artist JC Rivera’s new The Bearchamp vinyl figure will be released exclusively by Chicago’s own Galerie F! 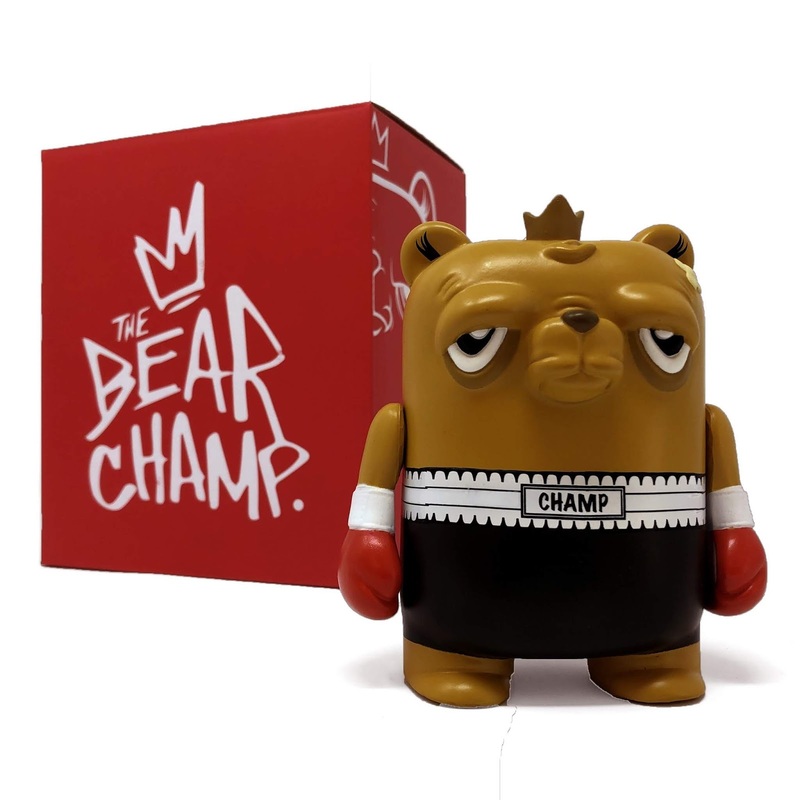 Produced by UVD Toys, the Galerie F TKO Edition Bearchamp comes wearing some sweet boxing shorts, stands 4” tall, and features 2 points of articulation. 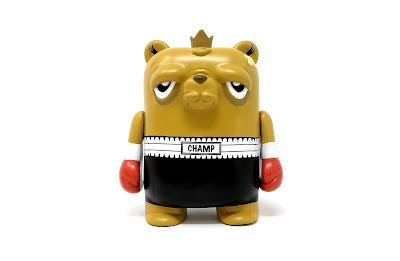 Limited to just 50 pieces, this limited edition figure retailed for $50 exclusively at the Galerie F online store. Sadly, it is now sold out! 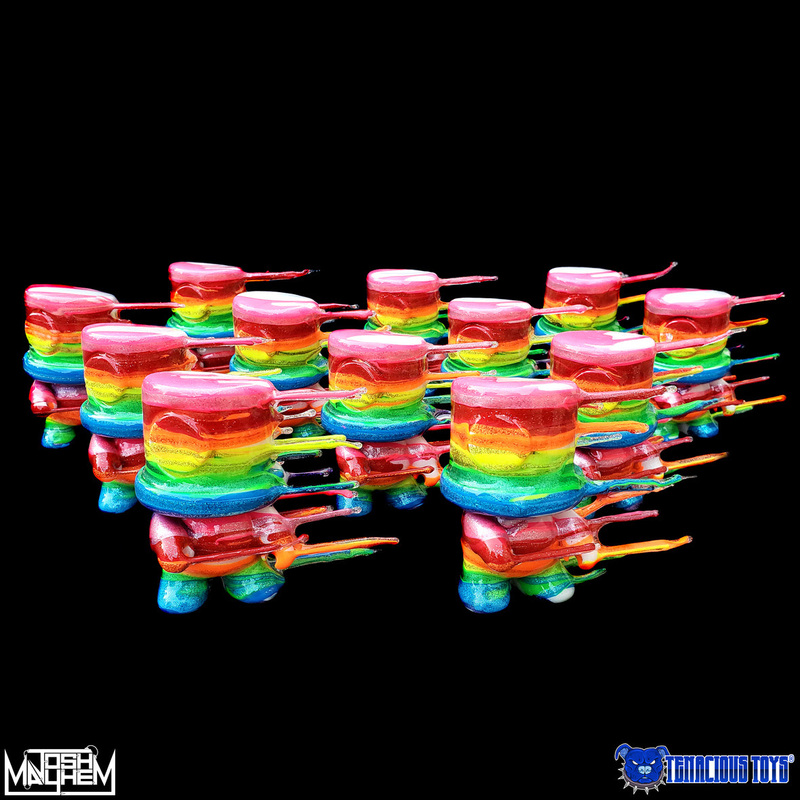 Tenacious Toys is teaming up with Josh Mayhem to release a limited edition series of customs based on the 4” Toy2R SprayeeQ Mini Qee, and they look amazing!!! 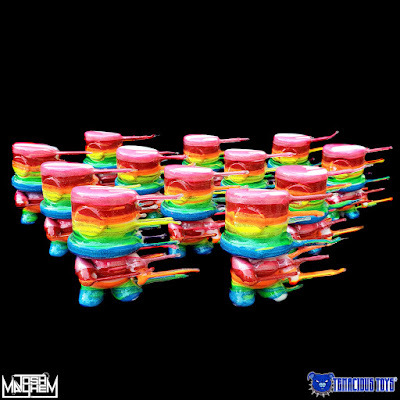 The Tenacious Toys exclusive Sprayed Away Series 1 features 12 unique, hand-customized resin figures in Josh Mayhem's signature “Blown Away” style. 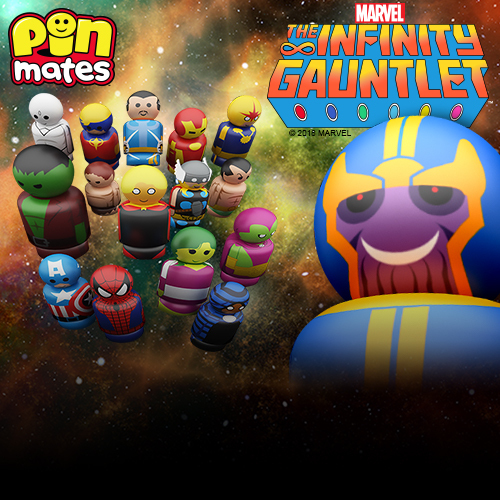 One of the 12 will be a randomly packed glow in the dark chase. These Sprayed Away Series 1 Custom Resin Figures by Josh Mayhem will go on sale at 3pm EST today, Wednesday, December 19th, at the Tenacious Toys online store for $150 each. 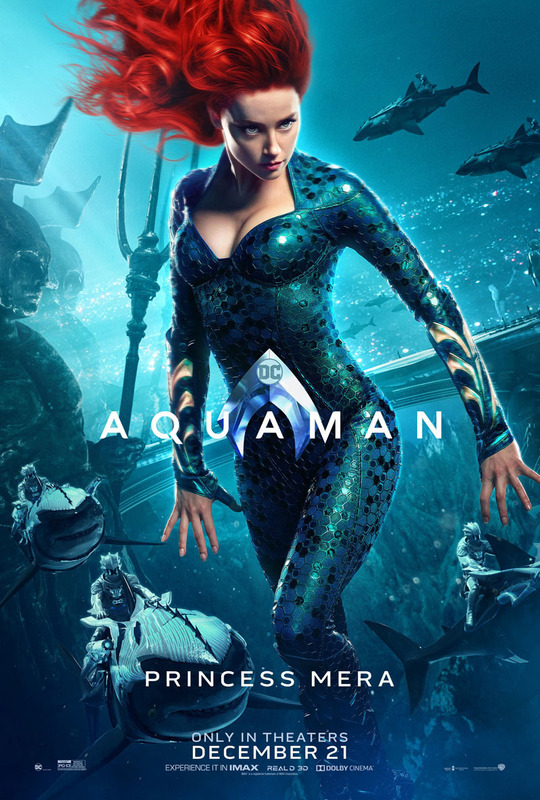 Wow, Mondo is ending 2018 with a bang! That’s because today Mondo is releasing the final entry of Jock's incredible Star Wars poster series celebrating the original trilogy! 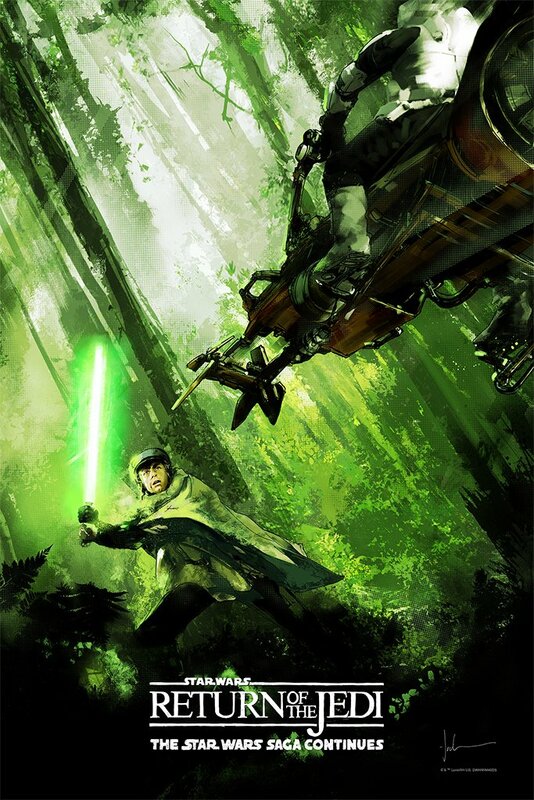 “I Am a Jedi, Like My Father Before Me” screen print by Jock concludes Luke's heroic journey from a hopeful adventurer to confident leader of the Rebellion and skillful Jedi. 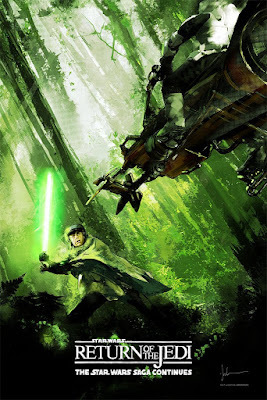 Set within the forest moon of Endor, Luke stands with his lightsaber at the ready as a Scout trooper races towards him on the iconic speeder bike. Like the other two prints in Jock's series, this poster presents the viewer with an intimate and highly kinetic POV. Over the last two years Jock has done an absolutely stunning job showcasing Luke's trials across the galaxy and Mondo couldn't be more proud of the series as a whole. 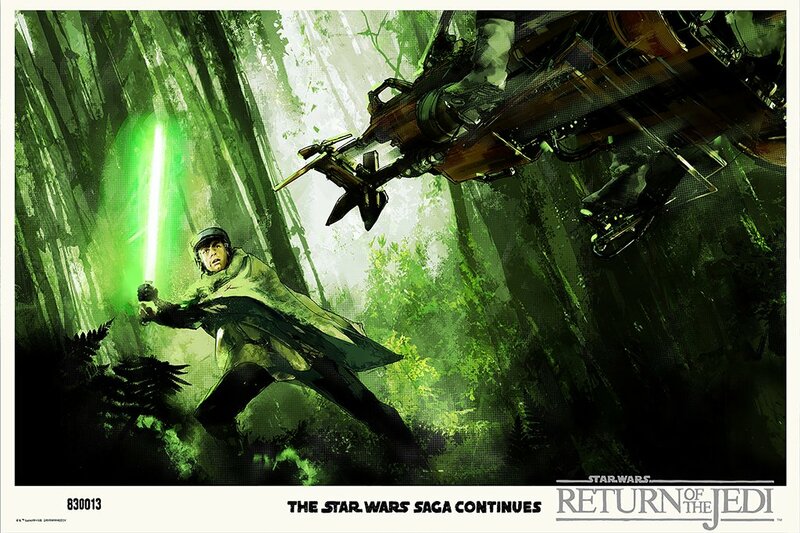 “I Am a Jedi, Like My Father Before Me” Regular Timed Edition by Jock is a 24”x36” hand numbered Star Wars screen print. It will be available starting at 12pm CST today, Tuesday, December 18th, through 11:59pm CST on Friday, December 21st, at the Mondo online store for $60. The print’s run size will be set by the number of orders placed throughout the rest of this week. 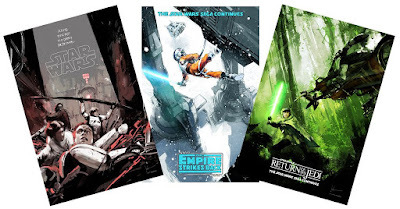 The Variant Edition will go on sale at the same time today for $80. This limited edition Return of the Jedi print measures 36”x24”, is hand number and limited to 275 pieces. 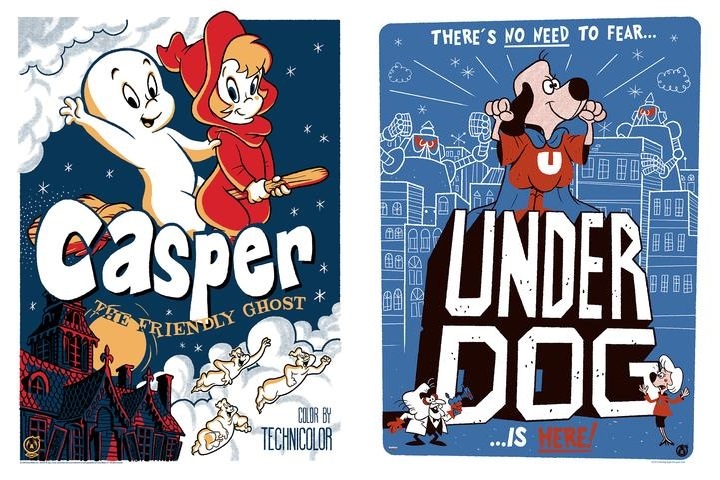 Mad Duck Posters has teamed up with artist Ian Glaubinger to release two awesome new posters for two all-time classic cartoons, Underdog and Casper the Friendly Ghost! 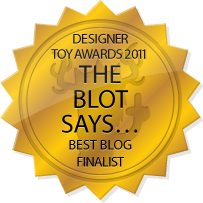 Ian is the perfect artist for these iconic animated television series, and The Blot absolutely loves how they turned out. 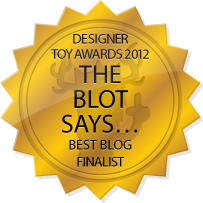 And what a great idea to release tan “Vintage” variants of both designs. 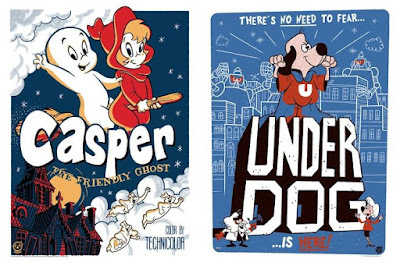 Here’s hoping we see more Underdog and Casper the Friendly Ghost releases in the future! 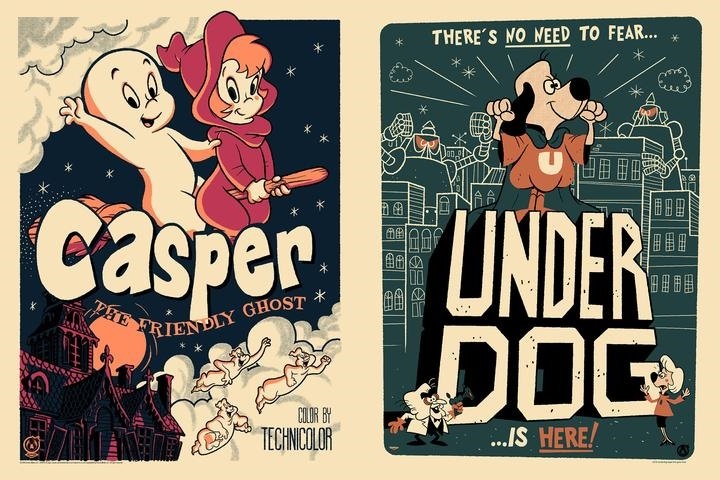 “Casper the Friendly Ghost” and “Underdog” by Ian Glaubinger are 18”x24” hand numbered screen prints. The Regular Edition of each print is limited to 100 pieces and will retail for $50, while the Vintage Variant is limited to 50 pieces and will retail for $60. Both prints are available now at the Mad Duck Posters online store, and if you buy both posters Mad Duck is offering a special discount of $10 off! Later today Justin Ishmael will be releasing his newest colorway of Craig Gleason’s The Ghoul, and it is epic! Check out the Clear Skele-Ghoul, which is cast in clear soft Japanese vinyl and features an internal skeleton with removable Ghoul head. After a super small run of these sold out almost immediately at Designer Con, Ishmael is now releasing a larger run at 9am PST today, Tuesday, December 18th, just in time for Christmas. The Ghoul stands 5” tall and features 3 points of articulation. Collectors can purchase this spooky edition at the Justin Ishmael online store for $75. For Bottleneck Gallery’s final release of 2018, they’re teaming up with super popular artist Matt Ferguson to release these epic Rey and Kylo Ren Star Wars: The Last Jedi screen prints! 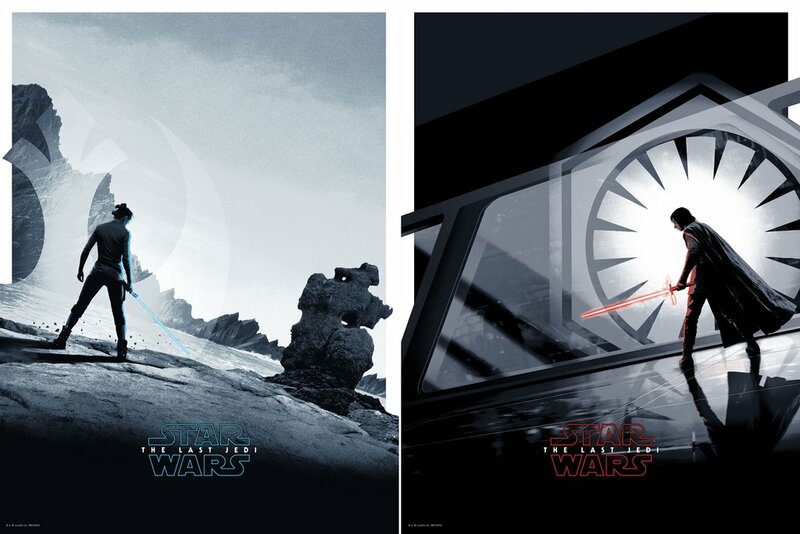 Originally designed as offset prints for a movie theater giveaway (seen here), these beautiful images of Rey and Kylo Ren are now available as limited edition fine art prints. “Rey” and “Kylo Ren” by Matt Ferguson are 18”x24” hand numbered Star Wars: The Last Jedi screen prints. Each print is limited to just 295 pieces and will retail for $50 or $95 as a set. These officially licensed prints will go on sale at 12pm EST today, Tuesday, December 18th, at the Bottleneck Gallery online store. Check out this hauntingly beautiful new art print “Withering” by Hal Rotter of Rotting Graphics! Epically crazy right? 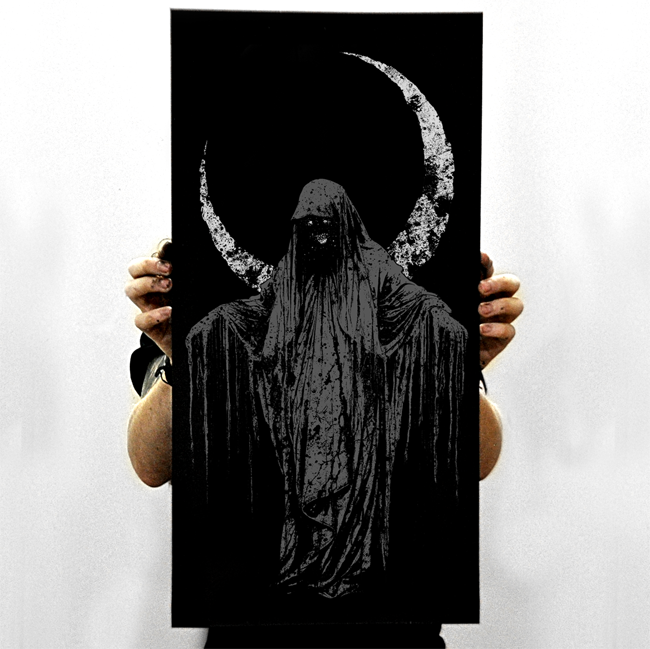 “Withering” is a 12”x24” signed and numbered screen print with acrylic inks on 100lb French Blacktop Paper. Limited to just 25 pieces, collectors can purchase this new art print now at the Hal Rotting online store for just $28.